Did you know the only player the Giants lost from last year’s team was Omar Vizquel, yet they’ve added Edgar Renteria, Randy Johnson, Bob Howry and Jeremy Affeldt? I’m not going to say those four players will bring a ring to San Francisco, but talk about improving the team, the Giants may already be the most improved team in 2009 and they’re still talking about adding someone like Manny Ramirez. Last year, the Giants were abysmal. They had ZERO on the power scale, with C Benji Molina hitting cleanup the majority of the year. That crucial piece of the puzzle remains empty, as Molina still appears to be the Giants best hope for any power. Pitching. Did you know the Giants have 3 former Cy Young’s in their rotation (7 total: Johnson ’95,’99-’02; Barry Zito ’02; Tim Lincecum ’08). 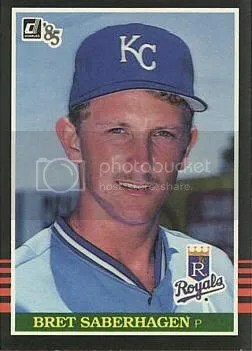 The rest of baseball’s active pitchers have a total of 17 Cy Youngs and that includes three pitchers currently without teams (Pedro Martinez -3, Eric Gagne -1 and Tom Glavine -2, meaning 11 Cy Youngs on 29 other teams). Throw in Matt Cain and Jonathan Sanchez, and I have to believe the Giants rotation is the best in the NL West, maybe in the whole National League. The additions of Howry and Affeldt should help the bullpen and could make the Giants pitching staff pretty tough. While it’s not terribly difficult to figure out the last team to have three former Cy Young’s on it’s rotation (Atlanta 2002 – Glavine, Maddux and Smoltz), it may surprise you which team was the last one to have three former Cy Young’s and not make the playoffs. Answer later. I have no idea who projected starters 1B Travis Ishikawa or 2B Eugenio Velez are. There isn’t one position player on the Giants roster who I’d list even in the top 5 of his position. That said, most of the players are pretty good team guys and can be good links from now until the future. If the Giants can somehow end up with Manny, they immediately become 1st or 2nd in the division. Or if they want to spend their money wisely, they abandon the Manny pursuit and sign Orlando Hudson to play 2B and one of the other big name OFs (Abreu, Dunn, Griffey, whomever). You have to figure even the addition of just Manny doesn’t make the Giants a World Series contender. Manny would likely draw as many intentional walks as Bonds did in his Hulk-ish years. By bringing in two guys for the price of one (especially Hudson) you may help your defense while adding some more pop to the lineup in two holes. 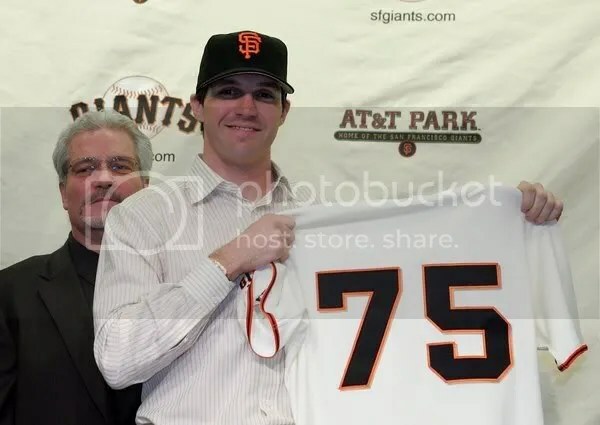 I’m not a huge fantasy guy, but I do play and I’m going out on a limb and calling for Barry Zito to be one of the best Sleeper picks of the 2009 fantasy season. With the Giants addition of Randy Johnson, Zito now has the chance to pick up some tips from possibly the best lefthander of the past 50 years. I wouldn’t go out of my way to take him, but if he’s around in the early to mid-teens you’ve got to think about him this year. This one even shocked me. The 2001 Red Sox finished 82-79. The Yankees won the AL East with 95 wins and the A’s won the Wild Card with 102 wins. Yet it was the Red Sox with 3 former Cy Young winners. The Giants will be much improved in 2009 even if they continue into the season with no other additions. Even at 45, Randy Johnson makes this pitching staff that much more exciting as he could be the best “coaching” addition any team made this year for a rotation that features Zito and the two youngsters in Lincecum and Cain. Not good enough for a playoff run as they stand, they do finish second in the division with this roster, 84-78. Wow – okay even I didn’t know that trivia answer! I like the Giants pitching. And who knows, maybe they are the “Rays” of this year!